The weather Melbourne Australia is famous for is to be unpredictable. It is said to have four seasons in one day! Some truth and some falsity to this. So, here is some information on the Melbourne weather. Many will not believe me, but I love the weather in Melbourne: It is not humid like other cities; the air is crisp and clean. Although a day may start off cloudy or rainy, you can be pretty certain that the sun and blue sky will come through, illuminating the lush green parks and gardens with a golden glow, most days anyway. People say, do not worry if you do not like the weather in Melbourne, just wait. It will no doubt change a few times over the course of a day. A bit of truth, a bit of exaggeration. The unpredictable weather Melbourne is blessed with, is created by its unique location, wedged between southerly arctic influences and the northerly dry and hot desert winds. Here is your daily Melbourne weather forecast! 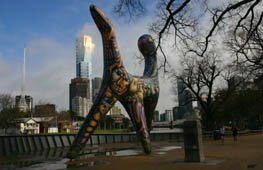 Melbourne is actually much dryer than the eastern Australian cities and has only about half of the Sydney annual rainfall. Most days I am able to get to the city on my bike. And I do not ride when it is raining. However, Melbourne has a larger number of cloudy days and it is somewhat colder than Sydney. Yet, compared to European cities, the climate in Melbourne is mild, particularly during winter. Melbourne is on roughly the same latitude as Athens and northern Africa! It is actually very pleasant and beautiful. Here is a list of Melbourne temperatures in Fahrenheit or Celsius throughout the year. The Melbourne weather has four distinct seasons: clear skies and fresh green budding leaves in spring, dry hot summers, colourful leaves in autumn, and cool crisp and sometimes grey and rainy winter days. It is, in the majority of the time, a comfortable climate to be in, whatever the season. After a prolonged drought at not much rain at all, Melbourne has come back to its good old self of frequent rain and sun, warmth and chills. After the long drought we are no longer complaining. It is great to see everything green. The very tight Melbourne water restrictions have even been lifted somewhat. During summer, it actually gets hotter in Melbourne than in the eastern cities, due to the hot desert winds. However, its dry hot days tend not go on too long and are regularly followed by pleasant cooler spells. It rarely gets humid and heavy. 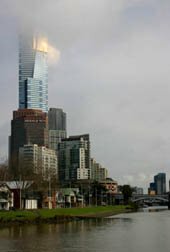 The sun is strong in a Melbourne Australia summer and you will need to have sun protection for Melbourne weather. Melbourne rainfall is on average 650mm per year, which is not really a lot. 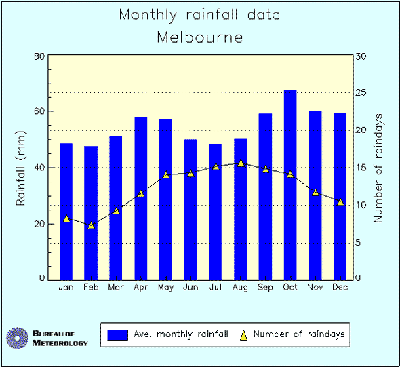 Here is a chart of Melbourne rainfalls throughout the year (source Australian Bureau of Meteorology). The weather in Melbourne Australia seems to foster creativity and style rather than outdoor sunbathing. It no doubt has contributed to the lively art and music scene in Melbourne, which is unmatched anywhere in Australia. That a large number of events and festivals are held outside however, is evidence of the great climate in all seasons. Fashion has also been influenced by the weather Melbourne is famous for. It has contributed to the style of dressing in layers that you can take off or put on to accommodate the daily changes common to any season.